Aimtec Launches the First Ever 3-Watt Dual Output SIP6 DC/DC Converter! Montreal, Canada: Aimtec Launches the First Ever Dual 3-Watt SIP6 DC/DC Converter! Aimtec is pleased to introduce its first ever 3-Watt single and dual output DC/DC converter in a compact SIP6 package. 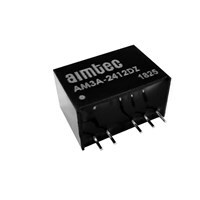 With a 4:1 ultra-wide input range, from 4.5-75VDC, the AM3A-Z comes with 1600VDC isolation and a regulated output. This is the smallest regulated and isolated 3-Watt converter ever designed by Aimtec! This compact design comes with a high efficiency up to 84%, no minimum load requirement and continuous short circuit protection. Furthermore, the ambient operating temperature is from -40°C to +76°C with full power up to 71°C. This truly innovative series can be used for applications that have limited board space such as mobile phone chargers, portable electronics, IoT and wireless applications.